Now and then someone asks me who my favourite crime-writer is, as they did last night at my book-group. My mind always goes a blank and I mutter something about still loving Agatha Christie. Last night I did in the end manage to come up with Andrea Camilleri, Michael Connolly (recent worthy winner of the CWA Diamond Dagger) and Ian Rankin. But I did feel a bit of a fool. After all I write crime fiction and – goodness knows – I also read plenty of it, so I ought not to be at a loss. Perhaps the truth is that there are just too many to choose from and I don’t have just one favourite. And at the moment too my head is full of my own novel, which I am right in the middle of writing (and which also accounts for my neglect of my blog). All the same, why didn’t I think of the excellent Ellie Griffiths, for example, whose Ruth Galloway series I enjoy so much? Or my favourite Scandi authors, Norwegian Jorn Lier Horst and Icelandic Arnaldur Indridason (though possibly uncertainty about pronunciation plays a part there)? There is also Simenon whose Maigret novels I return to again and again. And then there are all the Golden Age writers, such as Helen McCloy whose books I am reading or re-reading in preparation for talking about her at the annual Bodies from the Library in June. I’ve also been loving the collection of short stories edited by Martin Edwards in the British Library Crime Classics series. 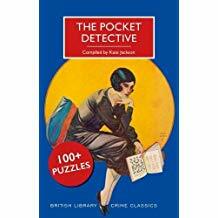 And by the way, that series is now accompanied by a very attractive little book that I have been meaning to mention, The Pocket Detective, compiled by Kate Jackson, and containing a hundred puzzles, including word searches, spot the difference, anagrams, and crosswords (that staple of the Golden Age). I was delighted to be sent a review copy and the puzzles are perfect for mulling over during a coffee break: an excellent little present for the crime-lover (or writer) in your life – or maybe yourself. Kate by the way is the author of a terrific blog about crime fiction:http://crossexaminingcrime.com. Happy New Year to my readers. I intend to do better with my blog this year and there may even be a new development in the offing. Watch this space. In my last blog I wrote about discarding crime novels. Here is one that survived the cull. In fact Arnaldur Indridason is one of my favourite writers and I had been saving his latest. I won’t be recycling it via the charity shop either. Reykjavik Nights (2015) takes us back to the very beginning of Erlendur’s career when, not yet a detective, he is a young policeman on night duty. We’re much closer in time to the defining tragedy of his life: the disappearance of his younger brother when the boys became separated from their father in a snow storm. It’s no surprise that he becomes fascinated by cases involving missing people. A woman on her way home from a night club vanishes. Around the same time a tramp known to Elendur is found drowned in a pond on waste land. Both cases have gone cold and Erlendur follows them up in his spare time, suspecting they are connected. It’s an engrossing read, beautifully paced, richly textured, with something of the haunting melancholy of those long Icelandic nights. A real treat.